The Holidays are literally around the corner. If you remember a couple months back we shared with you Dial's Halloween Foam Soap. Well they are at it again, this time with festive Holiday foam soap for us all to enjoy. Last week I had the pleasure of receiving all three festive Holiday foam soaps and the family and I have been enjoying using them. They certainly bring an extra pop of Holiday cheer throughout the house. There are three different holiday limited edition soaps with three different characters. We have Santa, a Snowman and a red nose Reindeer. I've put the reindeer and snowman in each of our bathrooms and put the Santa soap in our kitchen to use, which has worked out perfect, especially after baking and cooking. I love that my kids are loving these soaps. Not only are they getting a kick out of the characters that are on the soap, but they love washing their hands with foam soap. It makes it so much more fun and something they want to do instead of something they have to do. This is perfect, especially since it's cold and flu season and our family just got over being sick. Washing their hands with these foam soaps gets them even more excited for Christmas. 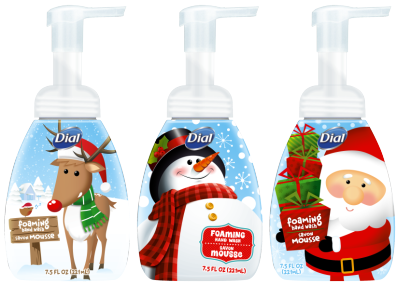 Dial's Holiday Foaming Hand Soap will be available for the entire month of December and retail for about $2.99 - $3.49 each, very affordable. Get them while you can before they're gone! Disclosure: All opinions are my own. I received Dial Holiday Foam Hand Soap at no cost for the purpose of this review. No other compensation was received. Add @theextremebean To Your Caesar This Holiday! Holiday Gifts Deals From @DKCanada!